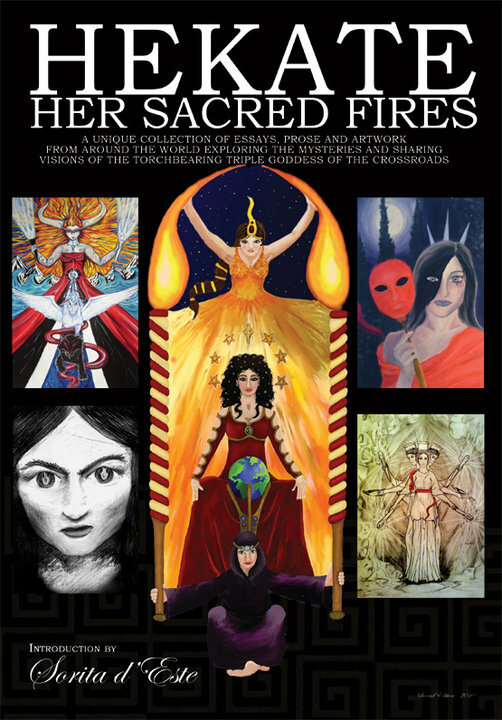 Describing itself as “a unique collection,” Hekate: Her Sacred Fires is a bumper-crop of varied writing and artwork from over fifty contributors on a complex and often misunderstood Goddess. And it doesn’t disappoint! What is clear from the outset is the commitment and love for a single deity felt by the contributors. Editor d’Este does a superb job. Not only has she put together an in-depth summary of Hekate’s historical background, and an extensive timeline charting Hekate’s appearances throughout history; but d’Este has also brought together Torch-Bearers and Key-Bearers (a phrase taken from the “Rite of Her Sacred Fires”, a special ritual that was devised and acted out across the world to celebrate the launch of this book) whose essays, prose, poetry and artwork paint a picture of a powerful and multi-faceted divinity. Acting as a big sister to the previously published Hekate: Keys to the Crossroads, the longer Her Sacred Fires paints an even bigger picture of how modern devotees interact with Hekate. This is not a “how to” on Hekatean worship; the reader should not expect to be drip-fed ideas to assimilate into their own practice. Instead it is a thought-provoking and intense exploration into the mysteries of the torch-bearing Goddess of the Crossroads. From the tender and personal experience in Amber Rose’s “Tattered Shards” and the visionary and revolutionary writings of Jade Sol Luna’s “Goddess of Supreme Consciousness”, to the understanding of Richard A. Derks’ “A Druid & Hekate” and the active worship (and phenomenal artwork) of Georgi Mishev’s “Threskeia,” Her Sacred Fires is both a shared personal adventure and the pagan coffee table conversation piece. Published in A4 format with more than three hundred pages and over sixty illustrations and photographs, this book is a wonderful exercise in opening one’s eyes to the limitless ways in which this ancient and powerful Goddess has survived into the 21st Century. Her Sacred Fires is a must for any who wish to learn or expand on their knowledge of Hekate.